Recycle! Empower those young creative minds to be resourceful and teach them the importance of recycling. This eco friendly educational kit will stretch their creative imagination while allowing them to participate in the pride of recycling. This kit is completely powered by natural light so no batteries are required. Solar panel, motor, parts and instructions are included, what you need are only Recycled Can, Plastic Bottle and old CD. 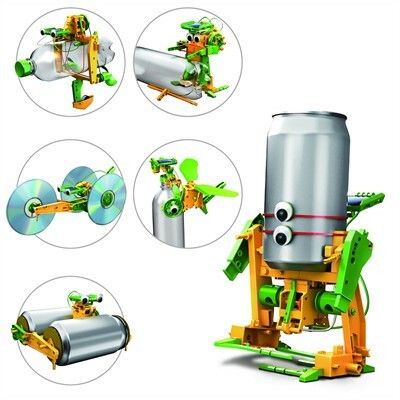 Easy to assemble instructions to create Street Roller, Walking Robot, Bottle Yacht, Drummer Robot, Flying Bird and CD Racer. Approximate 75 pcs.